POMPEY have agreed to play a pre-season friendly at Nyewood Lane for the third year in a row. Plans for the sides to meet for their now-established summer friendly came on the day the Rocks signed 20-year-old forward Jack Maloney following his release by the Blues. The friendly will take place on Saturday, July 18, and will see Pompey bid to make it three wins in three years at the Lane following 4-2 and 6-1 wins in 2013 and 2014. A couple of hours after the friendly was announced, the rocks confirmed Maloney’s arrival in their injury-hit squad. See Maloney help Pompey’s Academy team to an FA Youth Cup win in the video on this page. Cook said: “Jack has played ten times for Pompey’s first team over the past couple of seasons, but has now been released. He has also spent time on loan this season at Aldershot, Lewes and Poole Town. 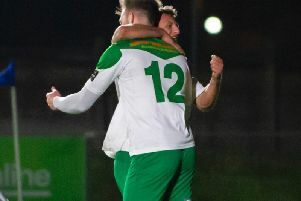 Bognor have seen forwards Ollie Pearce and Stuart Green and midfield duo Doug Tuck and Harvey Whyte injured in recent weeks, while the likes of Ben Johnson, Daryl Wollers and Paul Hinshelwood are all still out with longer-term problems. Pompey have already allowed full-back Snorre Nilsen to move to Nyewood Lane on loan and he made his debut in Saturday’s loss to Grays.